His birth, like the rest of his life, would be marked by fire. When the Great Prophet Elijah was born at Tishba in the Gilead region of the ancientlandofPalestine, his father Savah witnessed an amazing sight. While the child lay slumbering in his cradle, a radiant angel of God suddenly flickered into view. Moving swiftly and soundlessly around the tiny infant, the angelic presence wove a shimmering fabric of fire that completely surrounded him. Astonished, the fearful father soon noticed an even stranger event: The angel was actually feeding the baby with a flame! What could this remarkable sequence of events portend? Although the stricken Savah could not have known it at the time, his son Elijah (around 900-849 B.C.) was destined to become one of the most fiery and outspoken prophets in the history of the world. A Biblical figure of titanic proportions, Elijah (the name means “Yahweh is God”) would upbraid mighty kings during his hallowed lifetime, while also warning powerful nations that the greatest sin is the sin of turning away from God – and that the Lord’s retribution for those who worship false idols instead of the One True God will always include cataclysm and destruction for the idolaters. Born of the tribe of Aaron around the year 900 B.C., Elijah was a sensitive, God-fearing youth who soon demonstrated a passionate yearning for closer contact with the Almighty. Even as a child, the pious Elijah (also known as “Elias”) would go wandering through the desert in rapturous prayer and contemplation. During the prophet’s long and tumultuous lifetime in the Ninth Century Before Christ, his greatest confrontation would be with the idolatrous Israelite King Ahab and his cruel wife, Jezebel. And when Ahab’s queen convinced him to erect a temple to the Syrian god Baal (she was a Syrian herself), the stage would be set for one of the most fearsome confrontations in the Old Testament world: the terrible and terrifying struggle between Ahab and Elijah the Prophet! But this classic battle between the forces of true faith and the forces of rampant idolatry was only one of the extraordinary and miraculous events that would fill the life of this immensely significant Prophet of God. Sometimes referred to as “The Tishbite” (because of his place of birth), fiery Elijah would at various times defy ordinary reality and amaze his onlookers by performing miracles that dazzled the eye. Again and again, he would startle and terrify those around him by demonstrating the awful power of Almighty God, as he accomplished feats that defied human understanding. On one occasion, for example, the Great Elijah would pray to the Lord and through His Heavenly power, he would prevent the rain from falling for more than three years. Another time, at Mt. Carmel, during a contest designed to demonstrate the power of the One Living God (as opposed to the false power of the idols), Elijah would literally “bring down fire from Heaven” on the sacrifices he had prepared for God, thus proving the eternal reality of the True God of the Israelites. In another remarkable miracle that continues to inspire generations of Christians, he would greatly increase the amount of flour and oil in the larder of the widow Sarephtha of Sidon, thus preventing her from succumbing to poverty and starvation. And when her beloved son died, Elijah would be there to bring him back to life, in a miracle that seems to have prefigured the raising of Lazarus by the Son of God more than 800 years later. Again and again, the larger-than-life Elijah would find himself in extraordinary circumstances that would cry out for heavenly intervention. 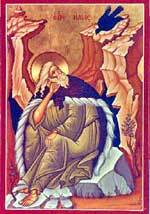 OnMt.Horeb, he would converse with the Almighty – while hearing the Voice of the Lord in a sighing breeze. Near the roaring River Horrath, he would hide from his enemies on the instructions of Almighty God – while being fed by flocks of obedient ravens. With his successor Elisha, he would divide the water of the Jordan River and then eventually be transported away to the Eternal Realms in a fiery, sky-borne chariot that was drawn by a team of flaming horses. And along with his great fellow-prophet Moses, he would appear to the Lord Jesus Christ, the Son of God, during a fiery transfiguration atopMt.Tabor. Clad in a mantle of sheepskin (known as a “melote”) and girded about the loins with a leather belt, the image of the fire-breathing prophet has been imprinted on the consciousness of the Western World for nearly 2000 years. Everything about Elijah took place on a grand and mythic scale. At Kisson, he slew 450 false prophets and priests who were engaged in preaching idolatry and leading their flocks into confusion and sin. At one point, when he was famished to the point of death, he was fed by an Angel of God – and drew so much strength from this heavenly repast that he was able to walk the desert for 40 days and 40 nights without pausing to rest! After prophesying that the idolatrous King Ahab would be destroyed for turning away from the Living God of the Israelites, Elijah would later also foretell the violent death of Ahab’s son, mighty Ohozias. Perhaps his greatest and most astounding triumph occurred during the end of his life, around 849 B.C., when he was suddenly picked up by the fiery chariot – while speaking with his prophetic successor, the holy Elisha – and rushed off to heaven in a celestial fireball! His astonishing departure from this earthly life took place under Josaphat, the King of Judea (873-849 B.C. ), according to most historians of the Old Testament. One of the most harrowing struggles to occur during the long life of the Great Prophet Elijah was his desperate battle with mighty King Ahab and his paganess-wife Jezebel. Because these two had introduced the perverted worship of the idol Baal into the life of the Israelites, Ahab’s country had declined into utter corruption and social chaos. Nor did Elijah hesitate to describe the disaster or its consequences. In a loud voice, he cried out to the King and Queen and charged them with having caused the nightmare the Israelites were then enduring. Elijah demanded repentance – and when Ahab refused to provide it, the prophet warned that the rains would dry up, the dew would evaporate, and the Israelites would begin to starve. And indeed, these events soon came to pass. Enraged by the accurate prophecies, Queen Jezebel ordered her assassins to kill him as quickly as possible. But Almighty God once again intervened and sent Elijah hurrying away into the desert for safety. At the River Horrath, he hid himself and was fed by the birds of God’s glorious mercy. After the drought and famine had lasted three years, the Great Prophet again arose at the command of God and returned to Ahab – in order to show him once and for all that he was not worshipping the True God of the Israelites but a foul imposter. All that long day, the pagan priests did their best to summon fire from their deity, Baal, but their fervent prayers went completely unanswered. Then, as darkness began to descend over the mountain, the Holy Prophet gathered twelve sacred stones and began to construct an altar with them. (The stones were clear symbols of the twelve different tribes ofIsrael.) After building the makeshift altar, the Tishbite placed the animal sacrifices upon the gathered firewood and ordered his followers to dig a ditch around the altar and fill it with water. At the same time, he demanded that the firewood and the sacrifices be drenched in water again and again. When these tasks had been completed, the altar and everything within several yards of it was sopping-wet and completely impervious to fire. Elijah prayed. In phrases ringing with authority, he requested that God Almighty should send down immortal fire that would ignite the drenched sacrifices – precisely in order to show that the idol-worship should cease entirely throughout King Ahab’s realm, and that the Israelites should return to the worship of the One True Living God of Israel. The outcome was unforgettable and unstoppable – but the mighty Prophet Elijah hadn’t finished yet. Next he prayed for the resumption of the rains that had been interrupted three and a half years earlier. And soon the deluge was fully underway. For days on end, the torrent raged and slashed across the parched land, washing away once and for all the desiccated remnants of the starved crops that lay withering throughout the ancient realm of Palestine. When King Ahab saw what the Prophet had done, he repented. More than that: He ordered that the pagan priests be put to death immediately, and the nation restored to proper worship of the True God. But Jezebel remained obdurate – as a Syrian, her heart belonged to the acolytes of Baal – and once again sought to destroy the life of the prophet from Tishba. But her devious strategies all failed in the end. Elijah went on to live for many years, and continued to prophesy. And then, after being carried off to Heaven in his fiery chariot, he would continue to inspire and encourage Christians for twenty centuries with the courage and steadfastness he displayed during his long life of service to Almighty God. That service has not yet ended, according to the traditions of theHolyChurch– which tell us that the Prophet will also serve someday as the “Forerunner of the Dread Second Coming of Jesus Christ.” According to the traditions, in fact, Elijah will first proclaim the truth of the Son of Man, then urge repentance – and he will be slain by the Antichrist in an act of betrayal that will signal the end of the world. The life of the holy Prophet Elijah is recorded in several of the Old Testament Books (3 Kings; 4 Kings; Sirach/Ecclesiastes 48: 1-15; 1 Maccabees 2: 58), and also in the New Testament, which describes Elijah’s appearance at the time of Christ’s Transfiguration at Mt. Tabor: (Mt. 17: 3; Mark 9: 4; Luke. 9: 30). The life of the Holy Prophet Elijah has amazed the world throughout most of recorded history, and his extraordinary presence is deeply imprinted on the fabric of Christianity. Born in fire and transported to Heaven in a chariot of flame, the Holy Prophet Elijah will remain forever an incandescent symbol of the loving and mysterious and eternal relationship between God and man. From Elijah we can learn that God honors those who seek and follow Him. The incarnate Angel, and the Prophets’ summit and boast, the second forerunner of the coming of Christ our God, Elias, the glorious, from above sent down his grace upon Elisseus; he doth cast out sickness and doth also cleanse lepers; and unto all that honour him, he poureth forth streams of cures. O renowned Elias, Prophet and seer of the mighty works of God, who by thy word didst check the rain clouds: Intercede in our behalf with the only Friend of man.